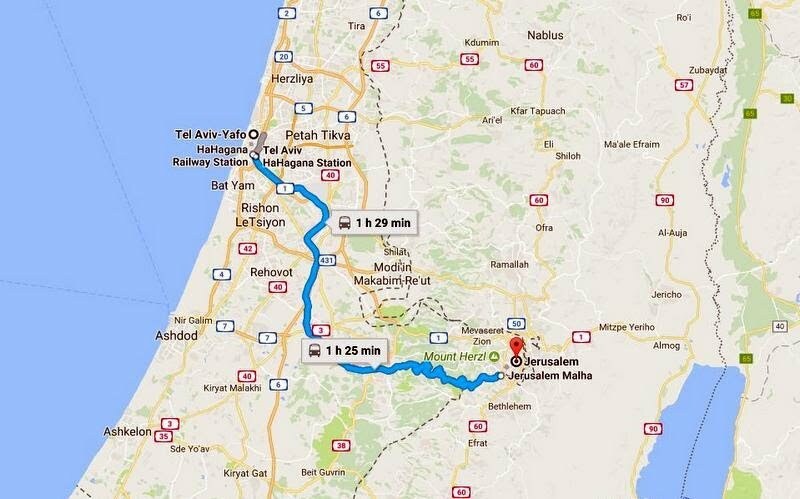 Next day, we took the train from Tel Aviv to Jerusalem. It was built by the British and winds through the hills separating the coastal plain from the hills on which Jerusalem is built. It will be replaced in 2018 with a high speed train which will only take 20 minutes. Although it's an old route, the trains were modern and clean - and cheap ! We stayed at the Prima Kings Hotel, which although very "ordinary" was well located and within walking distance of the old city. It was used by many tour groups and buses were pulling up to load and unload all the time. This was also where we met the rest of our group and our tour guide, Jonathan. Kris and I arrived around lunchtime, so we went for a walk to a nearby park and another converted railway station. The park, known as the Liberty Bell Park, was pretty enough and contained a reproduction of the Philadelphia Liberty Bell, although it seemed to be missing the crack which is such a feature of the original. The park and bell were established in 1776 for the US Bicentennial. The "First Station" was the other end of the original railway built from Jaffa on the coast. The railway operated until 1998 when the line was closed and the station felt into disuse. It reopened in 2013 as a shopping mall and entertainment center for children. Things were a bit quiet the day we were there, but we did have an ice cream! Next day, we started our tour with Road Scholar. As we were about to leave our room for the morning, our room safe refused to open. We couldn't get it open and neither could the maintenance man. To cut a long story short, we had to leave without my camera and didn't really get any photos of the Church of the Holy Sepulchre or The Mount of Olives. Eventually, the hotel opened the safe and replaced it with a new one, so by lunchtime, I had my camera back. We went back to the Holy Sepulchre that evening to get our photos. We started at The Mount of Olives, but because we had no camera, we have no pictures. Besides the olive grove, which is still there, we had a view of the city. Later in the day, we stopped for another view of the city from a distance. The Old City wall and the Temple Mount, with the Golden Dome of the Rock clearly visible. Our next visit was to Yad Vashem, The Holocaust Memorial. No cameras are allowed inside, which is a pity. We spent a couple of hours at the museum, but we could have spent more time there. We entered into the Old City and headed for the Temple Mount. The Temple Mount is all that is left of the base on which the Temple was constructed. It was destroyed by the Romans in 70 CE. There is access to the Temple Mount, which is controlled by the Muslim community. However, we did not visit the top of the Mount, but spent time at the Western Wall, which is the holiest place where Jews are allowed to pray. 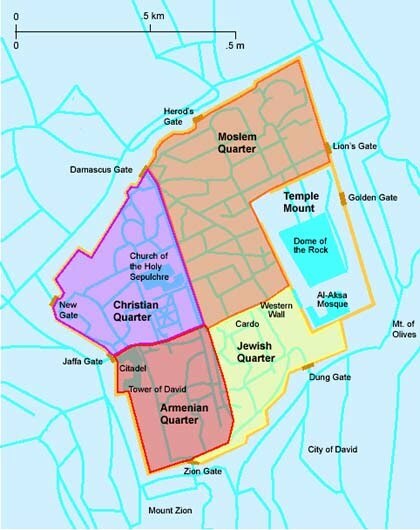 Much of the wall was built by Herod around 19 BCE although the temple itself was much older. Woman and men cannot pray together at the Western Wall, but a section is fenced off for women to pray. Nearby, the Dormition Abbey is a Christian complex built atop the ruins of a Byzantine church on the site of the Virgin Mary's death. As we walked through the Old City, Israeli jets flew low overhead, in celebration of Israeli Independence Day. Once through the gate, modern Jerusalem is waiting, although the old walls still dominate. That evening, Kris and I went back to the Church of the Holy Sepulchre. When we had visited in the morning, it had been VERY crowded and we didn't have a camera, so we couldn't take pictures. The pathway through the Old City is remarkably commercial, but it's probably been that way for hundreds if not thousands of years. The three most important sites within the Sepulchre are Calvary (or Golgotha), the Stone of Anointing and the Aedicule, which contains the tomb of Christ. Calvary is the place where tradition says Jesus was crucified. The natural rock can been seen through glass placed at ground level. Looking down from Calvary, you can see the Stone of Anointing, where traditionally Jesus body was anointed after his death. However, this tradition was only established during the period of the Crusaders and the present stone was installed in 1810. Finally, there is the Rotunda and the Aedicule, which is really a church within a church. The Aedicule contains the tomb where Jesus was laid after his death. There was long line of people waiting to get into the Aedicule, so although we peeped in from a distance, we didn't actually go inside. There were several other chapels cut into the rock and we spent some time walking around, but the three "biggies" for most visitors were three described above. As night was falling, we left the Church of the Holy Sepulchre to return to our hotel. Later in our trip, after we had visited Jordan, we passed through Jerusalem again on our way to Tel Aviv. We stopped just long enough to quickly visit the Israel Museum. We had a VERY quick "highlights" tour, but we could (and should) have spent MUCH longer. In the grounds of the museum was a scale model of Jerusalem at around the time of Christ, which clearly shows the Temple and Temple Mount as it would have been at that time. The Shrine of the Book. 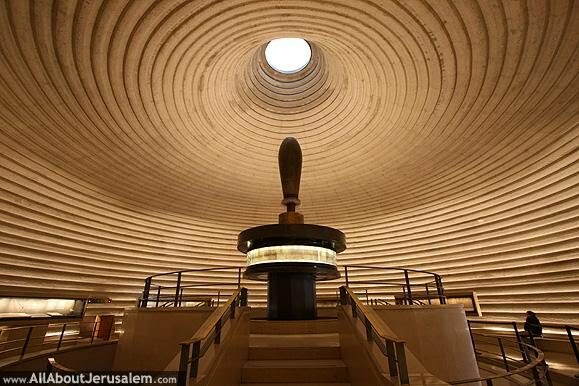 What you see in the picture is actually the roof of the Shrine, which contains the Dead Sea Scrolls. It's supposed to represent the lid of one of the jars in which the scrolls were found. The same is true in the rest of the museum, but no one seemed to taking any notice, so I did get a few pictures. Silver amulets dated 6th century BCE. They have inscribed on them the oldest known copy of part of the Bible known to this day. The benediction is known as "The Priestly Benediction"
Our final stop in Jerusalem was an Archeological dig, of sorts. Actually, the digging had been done some years ago and now we were helping to sort (or sift) through the rubble to see what we could find. The material had been removed from the Temple Mount some years earlier and was believed to date back to the Second Temple Era. After being briefed, so we knew what we were looking for, we split up into teams, took a bucket of dirt and started sifting. And start sifting. Most of what we found were small pieces of pottery and small animal bones. A coin would have been great, but none of our group found anything so exciting. However, we did find a nice piece of pottery, which Kris is holding. After a couple of hours of sifting, we left Jerusalem for our last stop, Tel Aviv and Jaffa.